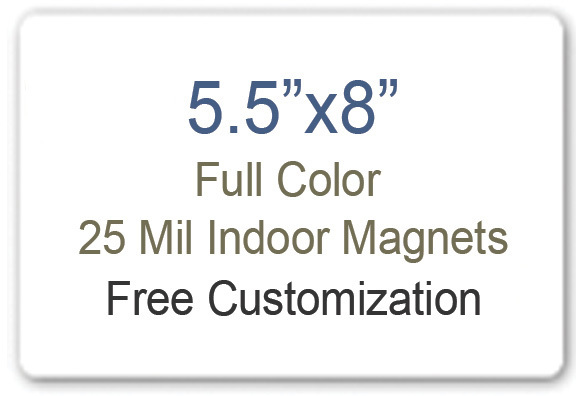 How 5.5X8 Magnets Transforms a Loser to a Smart Marketer? Does that sound like a magic pill? Does that sound like converting a loser to a smart marketer is an easy task? The straight answer is 5.5 x 8 magnets are not the magic pill of advertising and they won’t convert a loser into a smart marketer with a quick flicker of the finger. It requires some planning and creative ideas to make smart marketing materials from plain magnets. This blog discusses how a marketer facing loss of fame and money can easily reverse his campaigns for monetary benefits. What is the need for advertising and why should marketers do it? You might have encountered this question in the social forums more than once. You are left to think, what is the need for advertising, when word-of-mouth marketing is still in vogue. Advertising aids to create visibility and a word of mouth marketing campaign may never survive without a visible support! You can always lend that visible support and long-term visibility to your business information by gifting calendar customized magnets 8x 5.5. People would be happy to retain a customized calendar magnet over their refrigerator door as long as they can. Calendar magnets become the easy reference token because people cannot do without knowing the dates. Take it from here- you are selling a pizza and another XYZ store in your lane is doing the same, what is the difference? You haven’t tried to recreate any difference from your nearest competitor. You can easily highlight your specials or benefits over menu magnets or other promotional magnets. People would be happy to retain a short marketing billboard over their refrigerator doors or other visible spaces within the home. It would allow them the benefit of referring their favored items and ordering them at the snap of a finger. Menu magnets are perfect for food marketers, whereas others can do it by printing the information of their specials over these large sized promotional magnets. An extra saving here and there would lend a great shopping experience to customers. Customized 5.5 x8 magnets announcing a mega sale, discounts, reward programs or other money savings are appreciated by customers. They would love to spread the wisdom of smart purchase to their colleagues, friends, or family who wish to purchase from you. Allow them the reason to remember you until the next celebration by gifting them a joyous customized holiday wishes magnet. Wishing a customer on special days is considered an appreciative gesture and it helps to foster relationships. People would positively refer such marketers to their family and friends. Holiday greetings always trigger pride in an onlooker and make them believe that they are special. Fundraiser magnets are perfect for buying the attention of the crowd, whom marketers wish to sell their products. Fundraiser or charity events are considered best acts of social commitment and people take special note of marketers who indulge in fundraising. As said before a wise and smart act of advertising saves the face for a marketing facing heavy loss in their campaign. Now you might have understood that magnet advertising is not a magic pill or magic wand of advertising, rather an effective medium to position business information across the vast customer segment.